Charles Leonard Davis is seventeen years old in 1898. The following are entries in his small pocket diary. The words in bold black are Lennie's. I'm blogging Lennie's diary day by day (or week by week). I'm a bit behind but I'll catch up later this week. 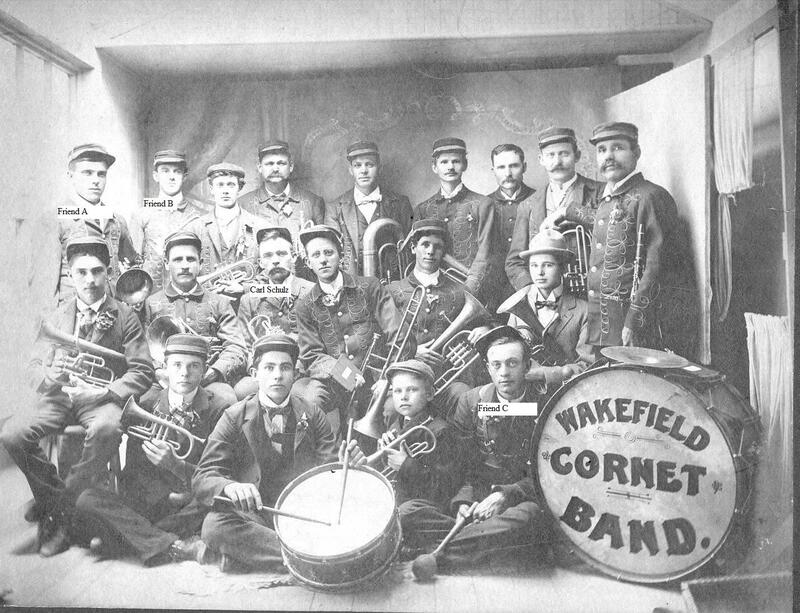 Meanwhile...read more about the Wakefield Cornet Band. Went to Presbyterien. S.S. girls & boys together. Ollie and ma took me out to Fritz to plow corn. Tired as the D_ _ _ _. Worked a half a day walked to town watched soldiers drill. A hot and windy day. Soldiers got word they were agoing to leave. Big crowd, sad, town seems lonely. Went in country with Charlie. Speaking of the band...remember when I mentioned Lennie playing in the Wakefield Cornet Band? (read here). Lennie is not in this photo but his brother-in-law Carl Schulz is. He's the guy just to the left of center with the blonde mustache. I do not know the date of this first photo but you can see there are men and teen boys in this photo. We recently visited the small museum at the old train depot in Wakefield and I found another photo of the band. This second photo was taken in 1904 when Lennie would have been 23 years old. He is not in this photo either. As you can see the band members are school age. Perhaps there were two cornet bands...one for adults, one for teens.